Well, did #CalledIt for GW19, Edin Dzeko, deliver or WHAT? Boy, was I happy about this one, especially as it was Chief's captain choice as well and since there were a lot of people who seemed to think that he wasn't even going to play, let alone score. And what do you know, he got 9 points with 3 BPs awarded to him. Yes! I would love to finish the year on a high and that is why I turn to Arsenal this week. They play Cardiff City at home (Walcott might be a good captain pick if he plays in the end) and recent injuries to Giroud (who finally scored one last GW) and doubts including Rosicky, Wilshere and even Walcott, I believe Podolski should be given a start. He played a little bit over 100 minutes this year and scored THREE goals and assisted one! Do you think he can get a hat trick if he plays the full 90 minutes? Unlikely, but he should be good for some attacking return. Lukas Podolski, Polish born German footballer, is my #CalledIt for GW20. Alright, so with this week's #JackInTheBox there is a virtual all-you-can-eat buffet of fixtures involving the bottom 8 sides. 6 of them square off with one another in 3 different fixtures, with Sunderland hosting Villa, Fulham hosting West Ham, and Crystal Palace hosting Norwich. The other 2 clubs in the bottom 8, Cardiff and West Brom, play away to Arsenal and home to Newcastle, respectively. I'm picking Chamakh for a number of reasons this week. First, Palace have been killing it at home recently and Chamakh has been in good form. Second, everyone wants his hairstyle but no one can quite duplicate it. It's almost as if it defies every natural law of physics related to human hair. And of course third, @FPLHelp is a diehard Palace fan, will probably be at the match, and the thought of someone I kinda "know" being at an EPL fixture watching my #JackInTheBox pick score a goal in person while cheering for his beloved team is just too good a possibility to pass up. If you want to know what it's like to experience Selhurst Park during a home fixture, check this video out. One of the coolest videos I've seen in a while. Really hate being an ocean away sometimes. One day I will experience this instead of just getting chills watching it on YouTube. I'm delighted that my risky captain pick/#CalledIt did well for me in GW 19, when many other players were rested or didn't perform. But you know what, I'm disappointed at the same time too! By Saturday night I had scored 30 with a -4 hit factored in (well above the average) and had 6 in play for Sunday. Yet I ended up with 57 points. Part of me thinks that Dzeko should have scored more goals, then again at least he scored! By my calculation, a par score for the festive period (GWs 18, 19 & 20) is a lowly 150. I have scored 100 from 18 & 19, so a score of 50 on New Year's Day would be the absolute minimum for me to aim for. I didn't want to tinker with my team for GW 20, but a deluge of injuries/doubts (and Silva's) suspension has forced me into a -4 hit. I was going to buy Mertesacker to replace Ivanovic. But I didn't want to lock a lot of funds into defence. I decided to buy Koscielny as he is cheaper, not fatigued from the fixture jam and with 5% ownership is just about a differential. As for my other transfer, I actually was content with R. Morrison as West Ham have favourable upcoming fixtures but he is still injured. Nolan seemed like the ideal alternative with his recently discovered form. But I think he is a tad over-priced, despite West Ham scoring 5 goals in 3 matches. In the end, I opted for Sterling. His fine run of form since 4th December could see him sneak into England's World Cup squad - all the more incentive for him to carry on with the status quo. As for my captain, I could have easily chosen Suarez. But I think he is a tad knackered after not being rested during the festive period. I can't see him scoring more than one at the very most v Hull. In addition, almost everyone that has him will probably captain him. In the end, I decided to give the armband to Walcott. His ownership is 5 times less than Suarez's and he also has a decent home fixture which could see a goals fest. On a final note, the Winter Wildcard is almost in play. Use it sensibly and try doing so nearer to the end of January if you can. Has failed to keep an away clean sheet against any top 10 team. Facing an Arsenal team that has scored almost 2 goals a game at home. The crisis at Cardiff versus the challenge at the Emirates could see them lose badly. Assisted 3 & scored 2 since December 4th. Has become integral to Liverpool's goal scoring & goal creation. Has good upcoming fixtures - best to hop on to this bandwagon now! Has scored 4 and assisted 1 in his last 4 Premier League starts. With no Ramsey & Ozil, he will arguably be their most potent threat from midfield. Walcott may have had a lengthy injury lay off, but expect him to maintain his run of form. MAN CITY TO BEAT SWANSEA (2-1). ARSENAL TO BEAT CARDIFF (3-0). PALACE TO BEAT NORWICH (1-0). FULHAM & WEST HAM TO DRAW (2-2). LIVERPOOL TO BEAT HULL (1-0). SOUTHAMPTON & CHELSEA TO DRAW (1-1). EVERTON TO BEAT STOKE (3-2). SUNDERLAND TO BEAT VILLA (1-0). WEST BROM TO BEAT NEWCASTLE (2-1). MAN UTD TO BEAT TOTTENHAM (2-1). Looking back at Gameweek 19 - Chief's "LESSLINES"
HAMMERS LOSE THE LEAD TWICE AS WBA HOLD THEM IN A 6 GOAL THRILLER. VILLA'S WINLESS RUN CONTINUES AS LAMAH NICKS A POINT FOR THE SWANS. HULL SMASH 6 PAST STOCKDALE AS FALTERING FULHAM HIT A NEW NADIR. SUPER SPERONI BATTLES IN VAIN AS DZEKO SCORES THE WINNER FOR CITY. UNITED HOLD STRONG WITH A DOGGED WIN AGAINST CHIRPY CANARIES. TAN ISN'T THE MAN AS CARDIFF BLOW A 2 GOAL LEAD & ADD TO THEIR WOES. COLEMAN CAN'T STOP SCORING AS EVERTON RECOVER FROM THEIR BLIP. GUNNERS REMAIN AT THE TOP WITH A CLEAN SHEET WIN V GEORDIES. LIVERPOOL COME TUMBLING DOWN AS THE BLUES WIN AT THE BRIDGE. SHERWOOD INSPIRED SPURS MAINTAIN UNBEATEN RUN WITH EASY WIN. PLAYERS GET RESTED AS THE FESTIVE FIXTURE JAM REACHES MID-POINT. YOU MUST BE :( IF YOU HAD Y. TOURE, NEGREDO, ROONEY OR ZABALETA! DON'T PANIC BUT EXPECT MORE PLAYERS TO BE RESTED ON NEW YEAR'S DAY. Well hello again. These gameweeks are coming fast and furious; it seems like as soon as one ends the next is about to begin already. With the holidays in full swing and family in town to entertain and enjoy time with, I can't move fast enough to get any Twitter time or write articles; I can't imagine how the Eden Hazards of the world go 90+ minutes and then rejuvenate quickly enough to do it again 2 days later. Alas, GW19 is here and it's time for another #JackInTheBox competition! 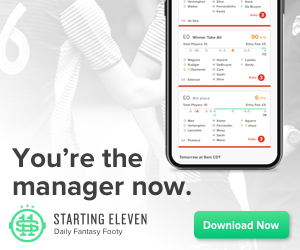 The Chief, partly in an attempt to open up the parameters to more than the same old struggling bottom 6 clubs, and maybe partly to give this clueless American a chance at getting one right for a change, has expanded the weekly #JackInTheBox parameters to any player in the bottom 8 EPL sides with FPL ownership of 5.0% or less. This opens things up to almost the entire bottom half of the table, so the options should start to get juicy. This week, two fixtures feature bottom 8 sides going head to head and as usual, they've stolen the majority of my attention. With Sunderland coming off an unexpected victory over Everton on Boxing Day and now traveling to a beleaguered Cardiff City side struggling to find their identity (and a new manager), I don't really know what to make of this one. A normally tough side at home, Cardiff were unmercifully thumped by Southampton just two days ago and things could implode for them now that Vincent Tan has cemented his spot as public enemy #1 with the sacking of hugely popular manager Malky Mackay. On the other hand, they could regain their rock-solid home defensive record and hold the side at the bottom of the EPL table scoreless. I'm leaving this one alone. Aston Villa host Swansea at Villa Park tomorrow, and despite the highest time of possession in the Premier League, the highest number of average completed passes, blah blah blah, Swansea has simply not turned the possession and pass-fest stats into goals and results. They may keep the ball longer and pass the ball more frequently and successfully, but every time I've watched them they've just seemed sparkless and blah. Sparkless and blah Andreas Weimann is not. I've been impressed with him for years. He's my kind of player; using energy, hustle, enthusiasm and passion and converting it to the kind of tireless performance that football fans feel good about paying for. He's easy to root for and reminds me a little bit of Carlos Tevez without the attitude and homesickness﻿. Score one for your buddy Walt tomorrow Andreas... I need something to brag about for a change. It just wasn't meant to be for my #CalledIt pick for GW18. It seemed so right, so perfect that I was certain Adebayor will deliver at least an assist, if not a couple of goals. Instead, it was a former #CalledIt pick, Christian Eriksen, who stole the spotlight and scored his first goal in Premier League. While I believe that the latter is also a good option for this week, as he is owned by only 1,7% of managers and his price is down to 7.1m, I want to look elsewhere than Tottenham this week. Enter Manchester City. Playing against Crystal Palace. At home. Yum. As good of a fixture as there can be. On top, City played their last game yesterday and are sure to rotate a couple of players. I was tempted by Jesus Navas (owned by 2,7% of managers) who delivered two assists and a goal in the last three GWs, but decided to keep Chief company and select the player he put the armband to this week. We all know he can score goals and he started this (pre)season on FIRE. With Aguero and Negredo forming a formidable tandem, he didn't get his chances, but I believe he might get his shot tomorrow. Or two, for that matter. If he does, he should score. #CalledIt pick for GW19, Edin Džeko. After a brilliant start with #FlyBuy in GW17 (Rickie Lambert - 7 pts) I came back to earth with a resounding thump in GW18. My choice of Roberto Soldado failed to deliver - along with the majority of the Tottenham team. A disappointing 1 pt return was not great. Still, this was the same score as Suarez so not a complete disaster. When I trialled #FlyBuy in GW16 before "going live" I chose a player who had been out for a while, but who I was convinced would go on a run of good form. After all, this is what this pick is all about; not just a "one week wonder". Admittedly Newcastle face Arsenal at home, but this boy has magic in his boots and I fancy him for another goal tomorrow. I scored 74 and 68 in Gameweeks 16 and 17, which somehow merited red arrows. I then bagged 43 in Gameweek 18 and managed a green arrow (& a 6k rise)! That may sound funny, but I also crashed out of the #FPLCup on a tie-breaker. A surprise victim of the so-called "Boxing Day Massacre". To lose in the first round of the cup is like being bowled out for a golden duck in an Ashes match or like losing to a non-league team of amatuers in the FA Cup. Ah well, you live and learn! Can't say more than that on this front. Gameweek 19 is due to start on Saturday and inevitably players will be rested or subbed off early. This made transfers all the more difficult, especially when Ramsey, Flanagan and Morrison are either major doubts or ruled out all-together. As a result I was forced into another -4 hit. My so-called "Ozil-Ramsey" fantasy football tandem yielded a lot of points from September to December, but I feel that has now come to an end with the Welshman's injury. In some ways the forced transfer is a good thing as I don't like doubling up with players from the same team in the same position - Their partnership was an exception to the rule. I decided to buy Walcott in place of Ozil as the former is cheaper in price. The latter is also due a rest. As for Ramsey's replacement, I had to look carefully and the only person that seemed viable was Eriksen. The young Dane has fine attacking prowess and his first goal for Spurs on Boxing Day could be a sign of things to come. Spurs seem to have a good run of fixtures and I think it's worth me taking a chance on him. As for my captain, it may come as a shock to you that I have chosen Dzeko. This could spectacularly flop or work wonders for me. I was going to give the armband to Silva, but I think he may not play a full match. As for the Bosnian, he is due a full 90 minutes of PL action and may just get his chance against Palace. His ownership is a mere 4.4% and he could be a one-off super differential of a captain. I have nothing to lose following my #FPLCup exit and feel bullish, thus I will take a chance on him. The last time I captained him was against Hull when he scored 1 point, but I won't let that put me off! Let's hope for better things. Bring it on! Can Yaya keep this up? I have been called an idiot and a fool this week on Twitter after I tweeted something like "Yaya can't keep this up". I was obviously referring to his stellar season so far in Premier League. Apparently, he can. The argument I was presented with is that he can, as he has been doing it for half of a season already. While I have not been lighting the FPL league on fire this year (currently ranked 13k+) as opposing to last year's 15th place in the end, I still like to avoid FPL players who are over-hyped (in my opinion) and who I don't believe will continue to deliver at such a level for a foreseeable future. Obviously, I get things wrong. After all, I haven't owned Ramsey at all this year for that particular reason. Cisse from two years ago also jumps to mind. At 9.9m and 42,3% owned, he has been dubbed as "the complete FPL player" and, looking solely at his stats (he scored 9 goals and assisted 3), one might agree. To make things more interesting, I decided to compare his stats to that of the best striker in Premier League at the moment, Luis Suarez. While I do understand that it's hard, if not impossible, to compare a striker to a midfielder, I actually wanted to compare their conversion rates more than anything. And this is what I got. Yaya Toure has had 30 shots in total in the first 17 game weeks, with 13 of those being on target, which is 43% of the shots. Not too bad. And, out of those 13 on target, he scored 9 goals! That's a tad more than 69% if you calculate his conversion rate only from shots on target. S-i-x-t-y-n-i-n-e. The conversion rate percentage falls down to 30% if you take into account all shots on target, but it's still higher than the conversion rate from one Luis Suarez at 25%. Suarez' conversion rate, taking into account only shots which are on target is 49%, which is a staggering 20 percentage points lower than that of Yaya. Now, I will let you draw your own conclusion from this, but to me, this seems a little too good to be true. While he is still on penalties, he might still keep this rate up, but I can't see it lasting the entire season. In my layman's opinion, Yaya CAN'T keep this up. P.P.S. I hand counted all shots, so there might be a slight discrepancy, but I would call that a statistical error. Facing a City team that has scored 37 in 9 at home. In fairness, Speroni has shown improved form but he won't be stopping City! Scored during his last Premier League start. Despite making only a sub appearance in #GW18 he almost scored. Reasonably priced & promising player. Often involved in goal scoring chances. Has scored 1 and assisted 3 in his last 3 Premier League starts. City's good home record & Palace's poor away form equates to a goals fest. Silva didn't play from 10th November to 7th December so shouldn't be fatigued. WEST HAM TO BEAT WEST BROM (2-1). SWANSEA TO BEAT ASTON VILLA (2-1). HULL TO BEAT FULHAM (1-0). MAN CITY TO BEAT PALACE (4-0). MAN UTD TO BEAT NORWICH (3-1). CARDIFF TO BEAT SUNDERLAND (1-0). EVERTON TO BEAT SOUTHAMPTON (2-1). NEWCASTLE & ARSENAL TO DRAW (2-2). CHELSEA TO BEAT LIVERPOOL (2-1). TOTTENHAM TO BEAT STOKE (3-1). Looking back at Gameweek 18 - Chief's "LESSLINES"
UNITED FIGHT BACK FROM A 0-2 DEFICIT TO TAME TIGERS AT HUMBERSIDE. PULIS'S PALACE CARRY ON FLYING WITH ANOTHER CLEAN SHEET VICTORY. CARDIFF IMPLODE AT HOME AS SAINTS HAMMER THREE PAST MARSHALL. HAZARD PROVES DANGEROUS TO SWANS AS MOURINHO'S MEN MOVE TO 2ND. 10-MAN EVERTON LOSE TO BLACK CATS & FINALLY LOSE AT HOME IN 2013. 5 STAR NUFC RESULT AGAINST 9-MAN STOKE AT HOME. ALLEZ LES TOON! CANARIES SUCKED INTO RELEGATION FIGHT AS FULHAM WIN AT CARROW RD. SHERWOOD'S SPURS DRAW AGAINST WBA DESPITE 20 GOAL ATTEMPTS. WALCOTT INSPIRED ARSENAL HIT 3 PAST IRONS AS THEY RECLAIM TOP SPOT. CITY MAINTAIN THEIR 100% HOME RECORD AFTER LIVERPOOL FALTER. SUAREZ DOESN'T ALWAYS SCORE & THE "RAMSEY BUBBLE" HAS NOW BURST. IT WAS A LOW SCORING GAMEWEEK. BRAVO IF YOU'RE STILL IN THE #FPLCUP! With Gameweek 19 due to start this Saturday, I thought it best to crunch some numbers to reveal our team of the mid-season. This is based on a unique algorithm created by me. It isn't simply based on the Premier League's actual ranking. Rather it considers an array of subjective and objective things, i.e. did a team punch above its weight? Did a team under-perform? How did a team "actually" do? Our results are shown below. Despite Man City maintaining a 100% home record and recently defeating Liverpool, they have just been pipped by them for our award. It really came down to the finest of details. My lower expectation of Liverpool prior to the season was proved wrong by their fine form thus far. This ultimately swung it in their favour by a mere 600 points, which is next to nothing on our scoring system. Honourable mentions must also go to Newcastle and Everton who proved me wrong and have done well with the algorithm. My high expectations of Chelsea and their failure to be higher placed sees them suffer, as is the case for Tottenham and Man United. As for the bottom 3, they don't include any newly promoted teams, but rather those who spent a fair bit in the summer without any subsequent joy. Congratulations to Liverpool Football Club. FPLH's Team of the Mid-Season 2013/2014. Gonna make it short and sweet this week. The Christmas festivities and family time have left me with far few minutes to sneak away to Twitterville and FPLtown, but I have had a few minutes to scan the fixtures of the bottom 6 and see who's playing who. When Fulham square off against Norwich at Carrow Road on my favorite football day of the year, they will represent a tantalizing matchup between the 14th and 19th place sides in the current Premier League table. An important matchup and one that neither team wants to walk away from without a hard-earned point or three. I have yet to pick a Fulham player for my weekly #JackInTheBox, but the Craven Cottage side, fresh off the optimistic news that former Fulham standout and current US national team man Clint Dempsey could be rejoining them on a short-term loan come January 1, gets my nod. Despite recuperating from a groin strain, point man Dimitar Berbatov looks likely to feature and memories of his 5-goal haul while wearing the red of Manchester United is too juicy to pass up as he plays a central role in Fulham's offense and will be on penalty duty should the opportunity arise. Good luck, Happy Boxing Day, and don't forget to try your luck at Matej's #CalledIt contest for this gameweek! The identity of the person who invented the wheel remains a mystery to this day, simply because of the fact that it wasn't invented instantly, overnight. It was more of a process. While the oldest wheel discovered dates back to 3,500 BC, it is believed that it was invented already in 8,000 BC. Early men used to place rollers underneath heavy object so that they could move it easier over long distances. Over time, men invented the sledge, placed it on rollers as well and soon realized that the rollers became grooved with use, effectively making it even more effective. This realization led to the creation of wheels and axle in one piece and later on to what we know today. I have often wondered what I would have been able to show if I was somehow transported back into the past (which is not physically possible, at last according to some guy called Einstein, but let's just assume we can, for the sake of this paragraph) and I had to persuade people I was from the future. Sadly, I realized, not much. Which bummed me out a little*. The good thing is that I don't have to neither invent nor re-invent the wheel for this week's #CalledIt and I will be going for an "obvious" choice. He went from zero to hero in one GW and secured his interim manager a brand spanking new 18-month contract. Not bad. With Tottenham playing a WBA team that concedes roughly 2 goals on average lately, I believe he has a good chance of adding to his goal tally from previous week AND could help a certain Spanish forward re-emerge as a viable FPL choice. 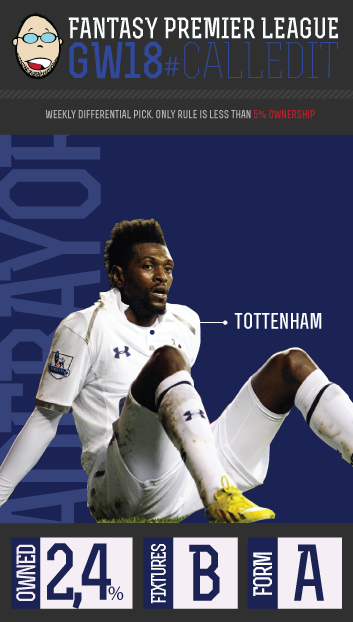 A former FPL heavy-weight, this week's #CalledIt, Emmanuel Adebayor! With Mirallas in GW16 and Welbeck in GW17 I will be looking to make it a 3 GW streak this week. And, if Welbeck slots back into the Manchested United starting 11 this GW, he could potentially add to his latest emergence in FPL. At least until RVP is back. But by then you will already have your wildcard to play with. * I have added "Learn how a radio works and build one from scratch" to my bucket list. While it may not work in 1256 AD, it could still look cool. Does anyone where I could get some electricity back then? 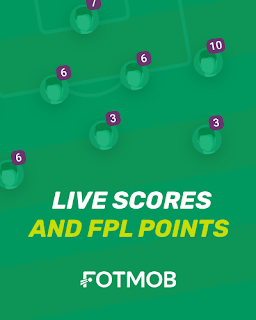 Looking back at Gameweek 16 - Chief's "LESSLINES"
How Do You Solve A Problem Like...Who To Captain? How Do You Solve A Problem Like...Rotation?